PlannerDan: Parks: Acres or Access? It is a view which is very biased against denser neighborhoods. 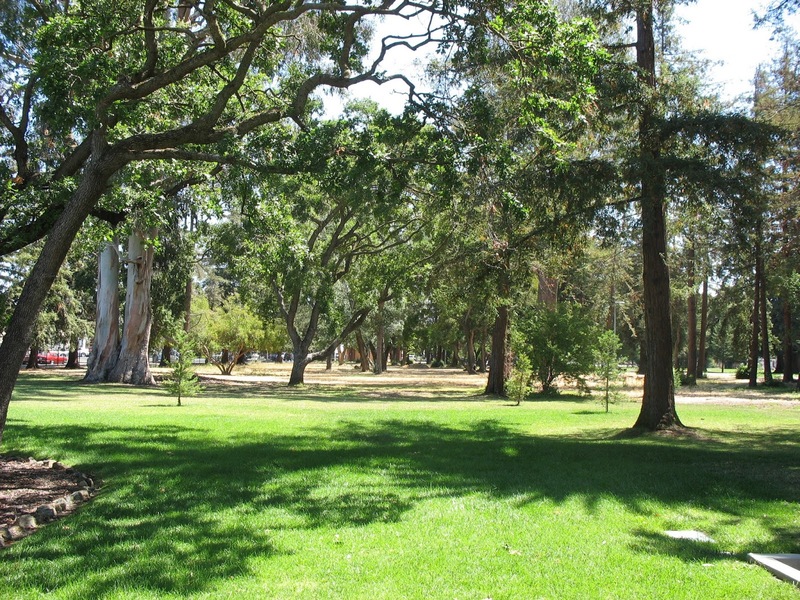 There is only so much land that can be used for parks. So, as density rises, the ratio of park acres per 1,000 residents declines, and the area appears to be failing even if it isn't. It implies that more people using a park is bad. This standard seems to penalize cities for placing a lot of people near their parks, perhaps assuming that there is something inherently wrong with a busy park. In fact, the opposite is true; underused parks can be a bit creepy and sometimes outright dangerous. Heavily used parks are safer, are better at building community bonds, and provide a better financial return. Focusing on acreage doesn't ensure access. Just because you have a lot of parkland, doesn't mean that people can get to it easily. The parks may be too far away from where people live or they could be blocked by barriers such as freeways. In such instances people will not get much enjoyment out of them. Dark green is for parks. Light green areas have good park access. Orange areas have a high need for park access, and red areas have a very high need for park access. Clearly, San Franciscans have great access to parks. 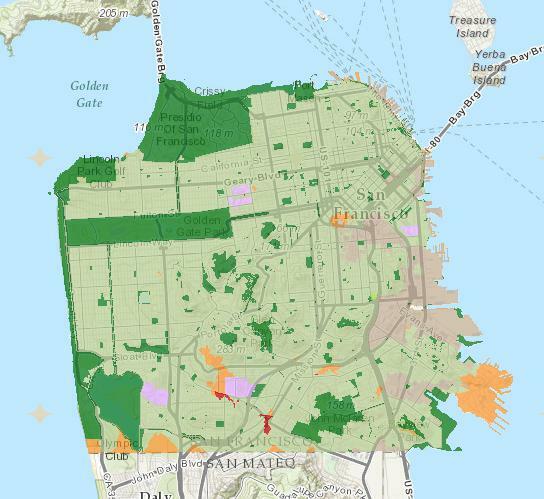 However, the National Park and Recreation Association would have you believe that San Francisco is failing, because their acreage ratio is 5.5 acres per 1,000 residents. I was happy to see this Atlantic article, because I have long been a proponent of access over acres. 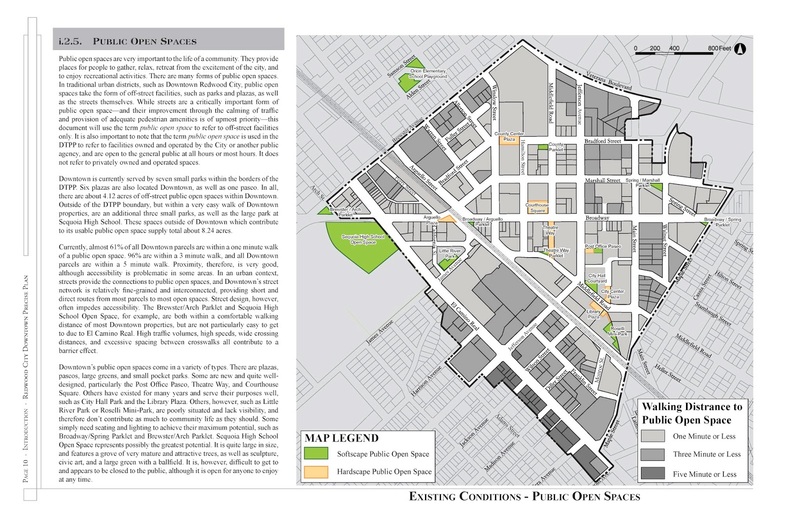 In 2010 I conducted an access study for Downtown Redwood City, which is shown below. I mapped out how many Downtown parcels were within 1, 3, or 5 minutes of a park. I found that every parcel was within a five minute walk of a park. 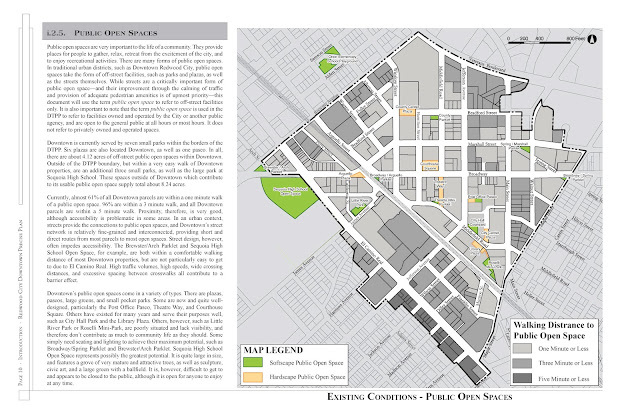 However, there were only about 7.6 acres per 1,000 Downtown residents. Are we failing? I don't think so. We plan on attracting at least 2,500 new apartments to Downtown, about half of which are under way. This is unquestionably good for the area, but it will drop the parkland ratio to less than 2 acres of Downtown parkland per 1,000 Downtown residents. This perfectly demonstrates the problem with the NPRA standard. All of these new residents will be within a 5 minute walk of a range of large parks, small parklets, and urban plazas and these facilities will be better used as people move in to the area. Calling this anything other than success is dubious at best. So my advice is this: When planning open space, focus on providing convenient access to great parks to the most people possible, and don't get too hung up on acreage ratios.